Esh Group Eagles Newcastle and Leicester Riders have joined London Lions in qualifying for the 2019 British Basketball All-Stars Championship. All three teams are guaranteed a top seven finish in the BBL Championship and will join defending All-Stars champions Surrey Scorchers at the Copper Box Arena, London on Sunday, October 13th, live on Sky Sports. Eagles’ win over Manchester Giants on Friday evening means they cannot drop out of the top seven this season, despite losing at league leaders Lions on Sunday. Riders have also ensured themselves a top-seven finish after registering wins over London City Royals and Cheshire Phoenix in round 26 of BBL matches. Lions had already qualified before this weekend’s play, as had Surrey Scorchers who take their place in the event as defending champions. That leaves four places in the eight-team event to be won. Worcester Wolves cannot qualify but any of the BBL’s other remaining sides can still make it. 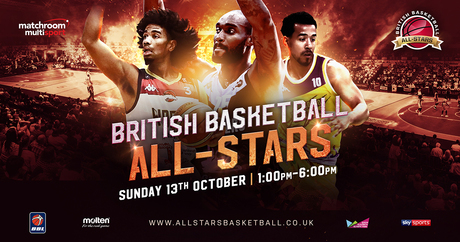 Featuring multiple 12-minute games, an All-Star 5-point line and the Golden Buzzer Power Play, the British Basketball All-Stars Championship is a non-stop afternoon of fast-paced basketball action which returns in 2019 for its third year. The tournament will again showcase the best of British basketball talent, with defending champions Surrey Scorchers joined by the top seven teams from the 2018/19 BBL season. Double elimination will be in play to separate the teams from eight down to four ahead of the semi-finals and final. Surrey Scorchers were crowned 2018 All-Stars Champions after a thrilling 36-33 overtime victory over Leicester Riders, while London Lions won the inaugural Championship in 2017. Tickets for the 2019 British Basketball All-Stars Championship are available now via www.allstarsbasketball.co.uk with tickets priced from just £24, with children half price.